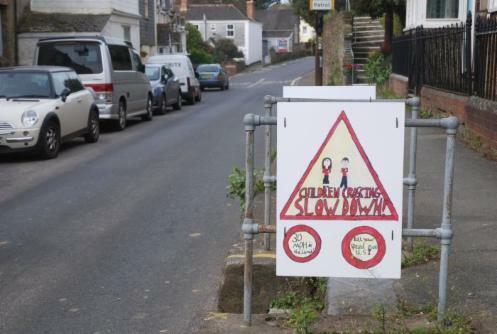 Our Devon County Councillor R. Gilbert reported at our March meeting that the road through our village might soon be reclassified from being an A road to a B road and consequent signage changes made by Devon County. 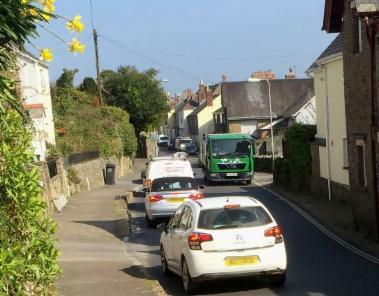 It is to be hoped that this measure could assist in eliminating the road from appearing on Sat Nav recommended routes and hence reducing non local traffic flows and the frequent congestion and delays which occur in the village. D.C.Cllr R. Gilbert arranged for a speed survey to be conducted in late 2018 by Devon Highways. 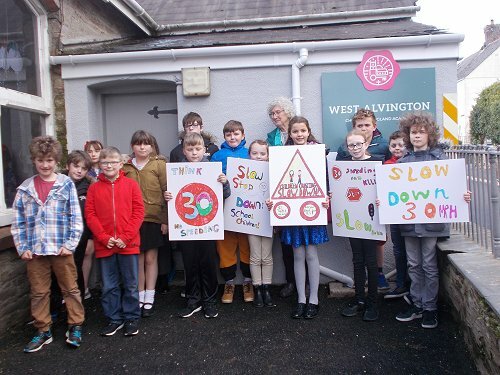 This in conjunction with Paul O'Dwyer Community Police Officer and West Alvington Traffic Action Group (WATAG) along with the Parish Council. 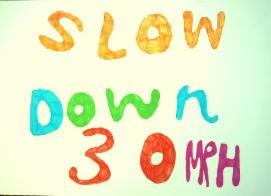 However DEVON COUNTY HIGHWAYS only look at average speed!!! 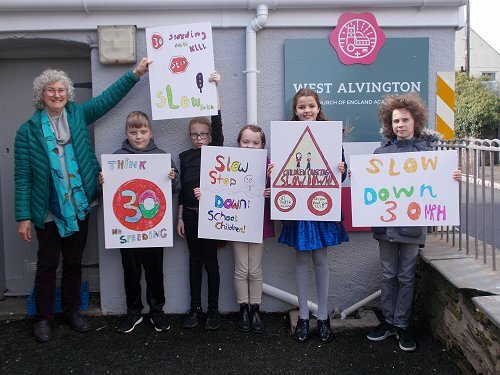 The Parish Council feel this is a meaningless statistic for action in places where there are frequent stoppages (as in West Alvington) and have obtained details of the actual data. 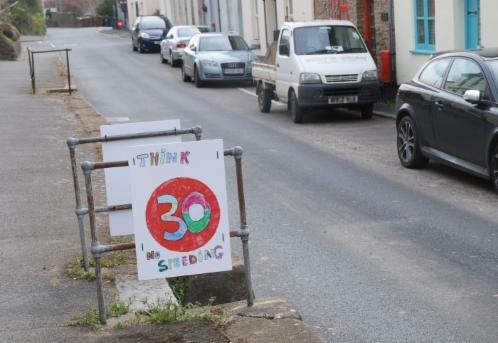 In spite of concern expressed by some as to the location of the survey, the result shows that, as reported in the Kingsbridge Gazette, there is worrying evidence of frequent and consistent speeding on the main road through our village. WATAG - contact Peter Everitt at School Cottage or Andrew Pascoe at Horseman's Close. Jo Pengilly is our Police Officer who covers our Parish and is Salcombe Neigbourhood Beat Manager based at Kingsbridge Police Station (Mobile 07921061657). 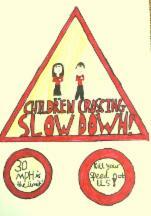 Meanwhile West Alvington Academy Pupils have recently drafted colourful speed posters. The Parish Council paid to have some of them enlarged. 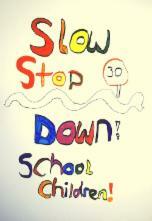 WATAG are already displaying the children's posters in places where drivers will readily see them. 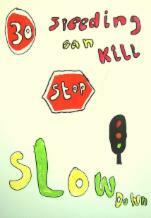 The hope is that they will help to make drivers think and thus moderate their speed. 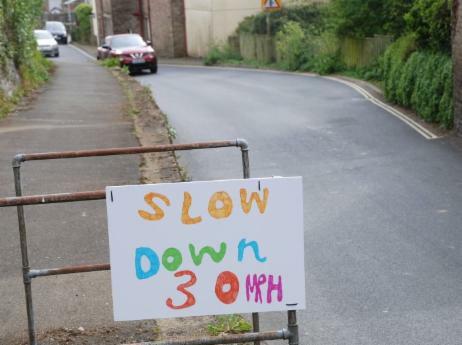 Our children are thereby helping to send a vital safety message to all drivers in our village to observe the 30mph speed limit. A big thank you to all at the School for assisting and especially the talented young artists. Photos of posters enlarged below unfortunately look a bit yellow. 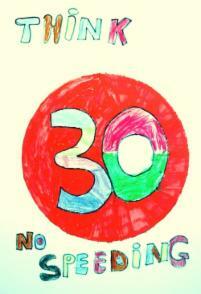 Sorry to all - that's due to our bad photographs and not the artists posters! We hope to have a traffic item on our Agenda for monthly meetings so that traffic news and ideas for improvements can be aired and shared. Please do come to Parish Council meetings.